The year was 1963. 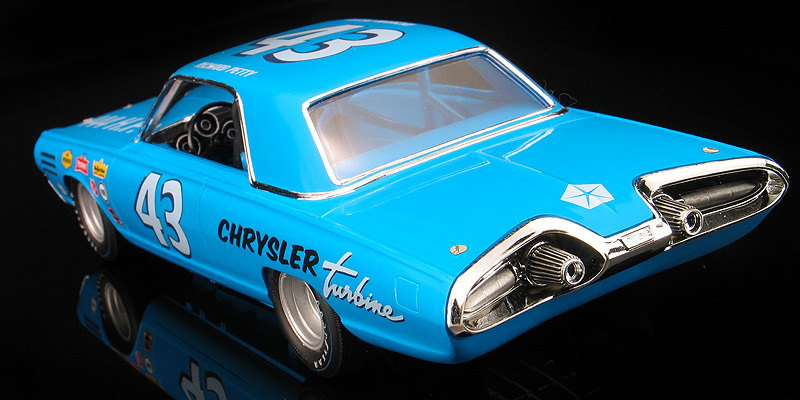 Chrysler Corporation had launched a test fleet of 50 turbine powered cars into the public the year before and was looking for a way to gain more attention for the cars. 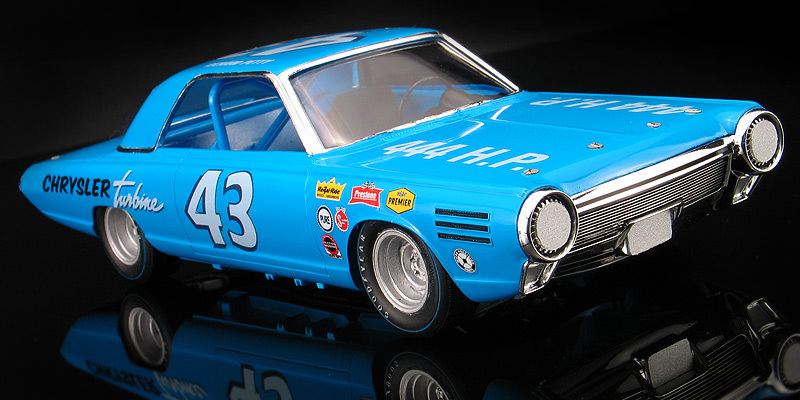 Chrysler's public relations department suggested that their up and rising young star, Richard Petty, drive one of the new Turbines in the '64 Grand National stock car racing season. Richard heard the idea and was skeptical that a Turbine powered car could be competitive, but agreed to help Chrysler build a prototype race car for testing. Chrysler shipped a hand-crafted body from coach builder Ghia in Turin, Italy to the Petty Garage in Level Cross, North Carolina. 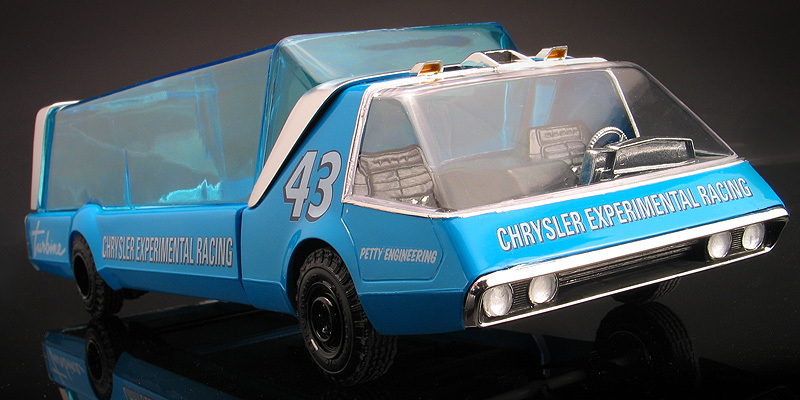 With help from Chrysler engineering, the Petty's prepared a car and sent it down to Daytona for top secret testing. While the Turbine was slow to accelerate, once it got going it would cruise effortlessly at high speeds around Daytona and Richard thought the car had promise. Then, they to decided to run some tests with the car in race traffic. This is where things started to fall apart. Heat from the Turbine's exhaust was very excessive. Spent exhaust gasses from the rear of the car were super hot at race speeds. 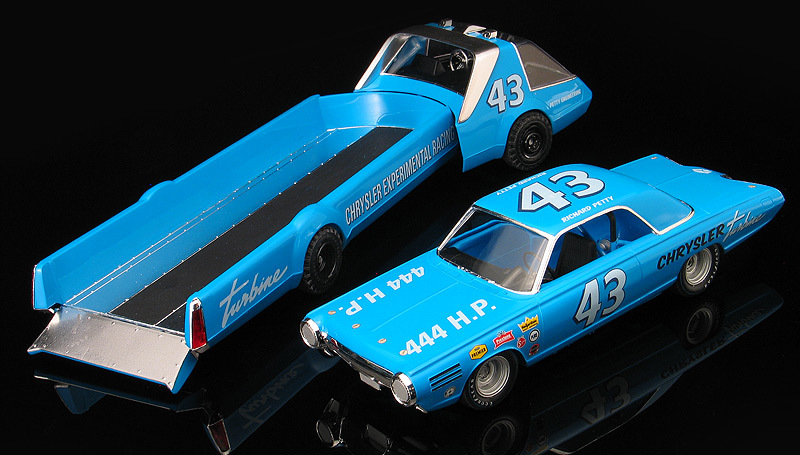 They tested a '63 Plymouth stock car drafting closely behind the Turbine car for 20 laps. The heat scorched the hood of the following car and got so hot the paint started peeling. It also over heated the following car and it blew it's engine. "Big" Bill France Sr. then got wind of the testing fiasco and sent letters to Chrysler and the Pettys telling them, "there's no way in hell I'm letting you all run a Turbine powered car in NASCAR!" And, that was the end of that. Chrysler P. R. had spend a significant amount of time and money on the project though and refused to let it all go to waste. They decided to take the race car out on the show circuit billed as a "Race Car of the Future" exhibit. 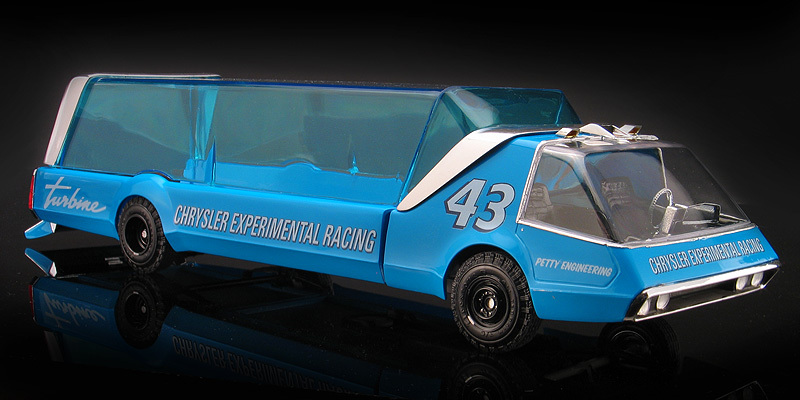 They built a special futuristic Turbine powered race transporter truck for the car and it traveled all throughout the U.S. during 1964-65. 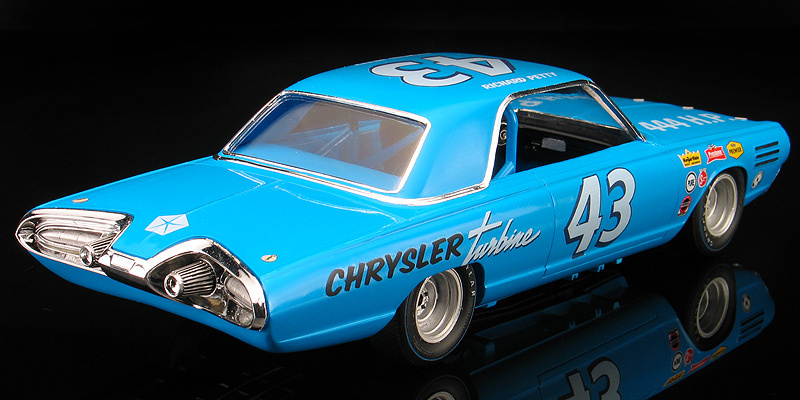 The Turbine Car program ended in '65 and the car and transporter were returned to Chrysler. Having completed their show duties, they were finally cut up and crushed along with 46 other Turbine cars. OK.. Time for full disclosure. The above story never happened. But, I thought it would make a great back story for a model I've wanted to build for a long time. 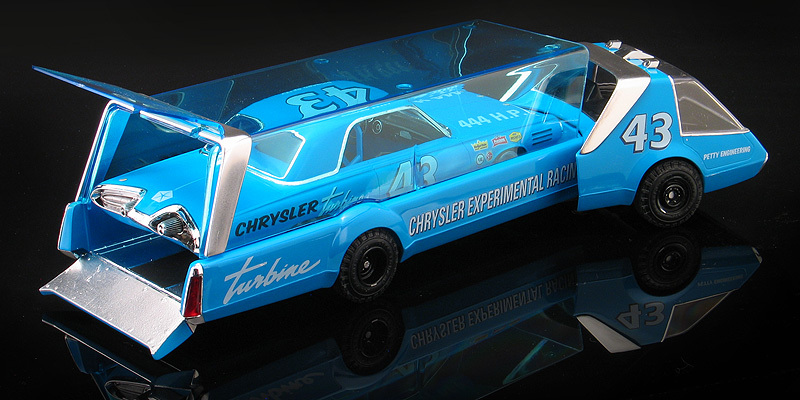 Using a stock Johan Chrysler Turbine car kit I thought it would be neat to imagine what this car would have looked like if Richard had tested the car back in '65. Then, after Round2 re-issued their fictional MPC Daytona Transporter kit I thought the two of them together would make a great combo to tell the story. It also gave me an excuse to build a couple of uncommon old kits not often seen built. To pull off my concept, I designed a set of custom decals for the project and my friend Dave Van printed a one-off set on his Alps printer. Next, I modified the Johan's kit body into racing trim by removing the rear fender skirts, vent windows, door handles and side trim. Although Johan originally offered a full detail kit of the Turbine, mine was built from the un-assembled promo version Okey Spaulding re-issued a few years ago. The promo version had a simplified interior with the seats molded in. I cut the floor and seats out of the promo-style interior bucket and scratch built a new floor and transmission tunnel sans seats. I also scratch built a roll cage. Because it's a promo style kit, there is no engine detail. 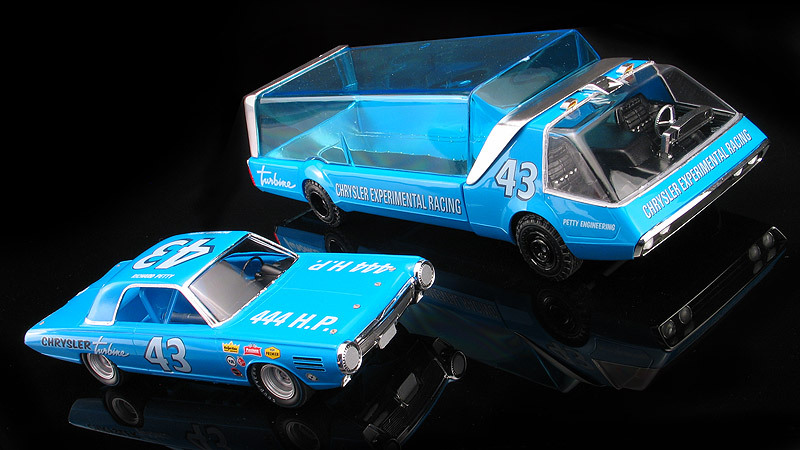 The body, interior and chassis of the car and truck were painted Tamiya TS-23 light blue which is a pretty good match for Petty Blue. For the vintage stock racing wheels and tires on the car, I cast my own set of parts in resin taken from various kits. Other mods to the Turbine car includes lowering the suspension to get the stance right, adding headlight covers and photoetched hood/trunk pins from Pro-Tech. 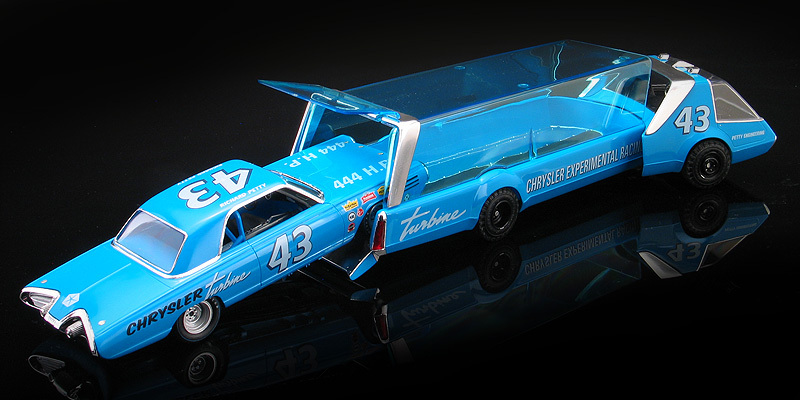 The MPC Daytona Transporter kit has it's origins in the '60's as well. It was a fictional truck designed by MPC and is somewhat toy-like by most standards, but looks perfect in this application. I built mine mostly from the box with a few exceptions. The MPC kit comes with a set of small-ish car like wheels and tires. I thought such a big truck should roll on something a bit more truck like. I dug through my parts box and mixed and matched my way to a set of narrow and deep offset 6-lug wheels. Your guess is as good as mine from what kits these wheels came from. The tires on the other hand were taken from an AMT '72 Chevy Blazer 4x4 kit. The wheels wells were also radiused on the transporter to fit the larger wheels. Other details on the truck include a set of cab lights and a chrome roof vent which help the truck look a bit more heavy duty. Again, these were taken from my parts box and chosen more for their 60's futuristic look then any sense of realism. One of the unique features of this kit is the pivoting cab which rotates upon the axis of the trailer hitch. Also, because the Transporter kit comes with both clear and blue tinted parts, I used the clear parts on the cab and the blue tinted parts on the trailer. The trailer roof also features wrap around trim pieces which I painted with Alclad to break up the monotone look of the kit.